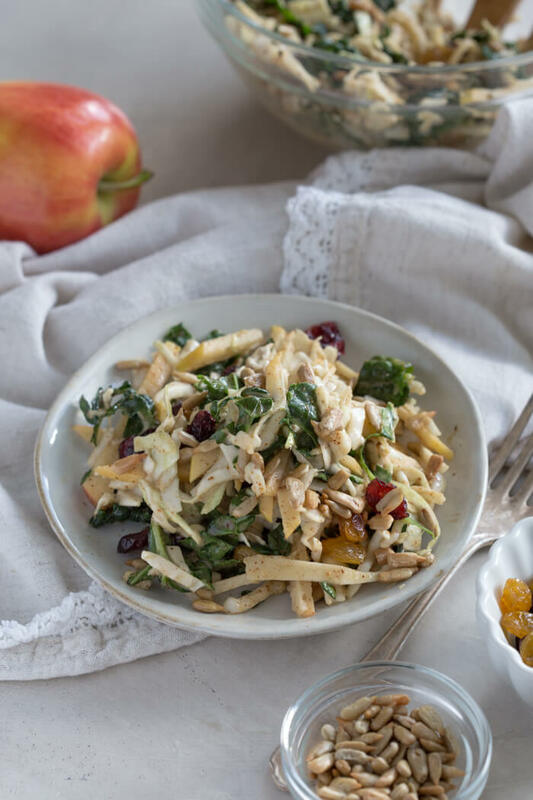 Apple Crunch Slaw with Almond Butter Dressing… yep, let’s talk legit fall food over here. 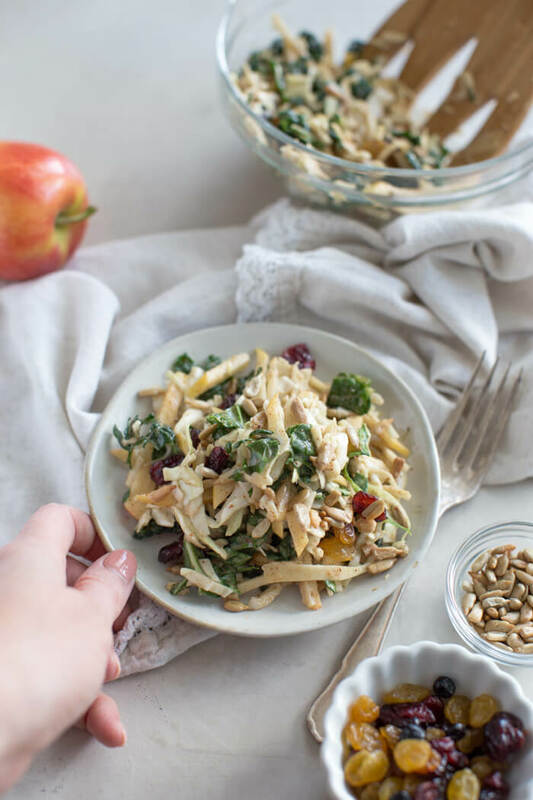 We love the crunch in this plant-based salad from all the shredded veggies, apples, and sunflower seeds. 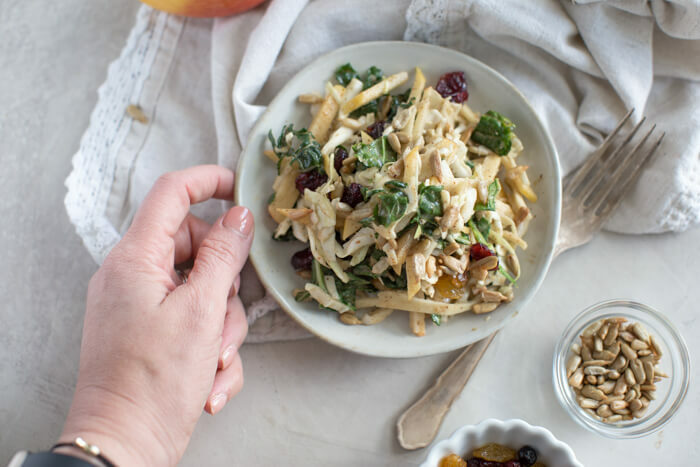 I’m all about chopped salads or “slaw” in this case because sometimes just the way you prep your veggies can make a huge difference in their craveability. If you’re asking me my opinion, chopped salads and slaw get my vote any day. Maybe it’s the dressing to veggie ratio or tenderness that the extra chopping lends to veggies, or just the fun shape, but whatever the case may be that makes chopped salads and slaw superior, I’m game. Because who couldn’t use some more tasty veggie recipes in their life? Annddd almond butter dressing? Say what?! I know, I know my friends. This creamy almond butter dressing is a blend of apple cider vinegar and almond butter spiked with a dash maple for sweetness. And I know how much you love your almond butter dressings because that recipe I just linked continues to be one of the most popular on my site thanks to you guys (and it’s positive Google vibes). A creamy tangy almond butter dressing made with 3 simple ingredients is just want you need to jazz up a fall salad. 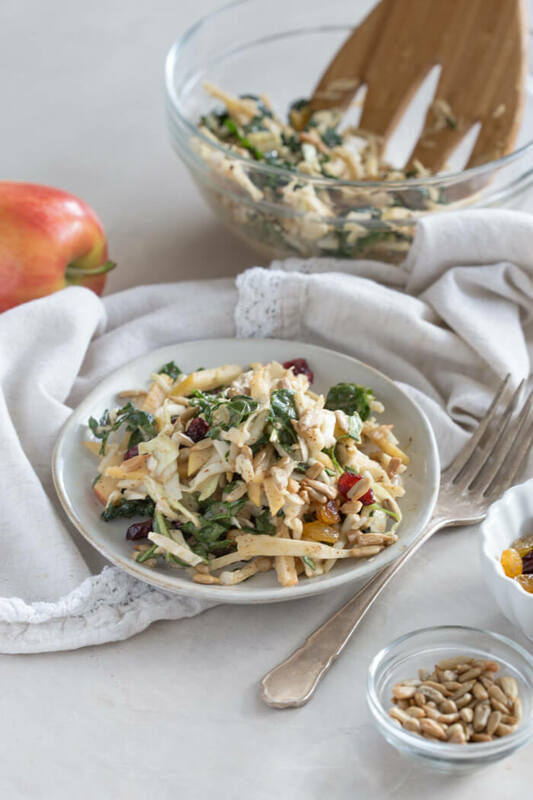 You’ll be downing a whole lotta veg in no time because the flavor combo in this apple crunch slaw is addicting. Don’t miss my cooking demo at Sprouts! Calling all Orlando friends!! 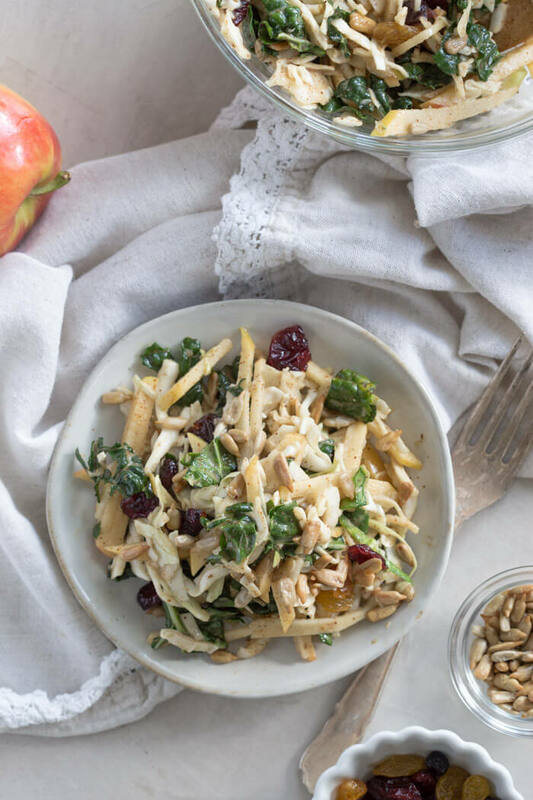 If you want to give this yummy slaw recipe a try and to get a chance to shop the store before grand opening, be sure to stop by the new Winter Park Sprouts Farmers Market for Friends and Family Night tonight! Get the details here! 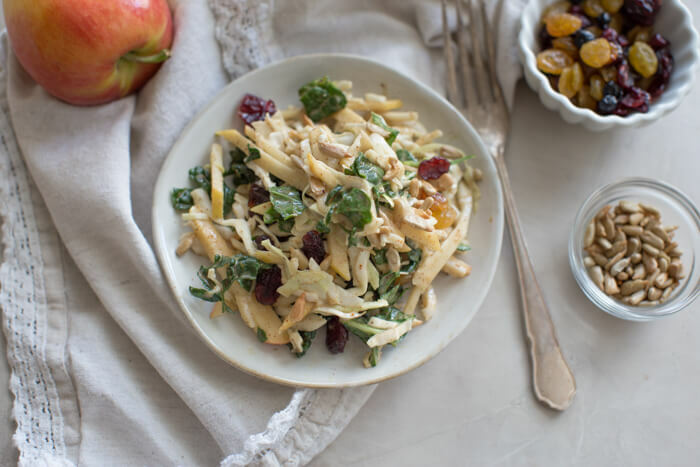 Apple Crunch Slaw with Apple Butter Dressing is legit fall food. 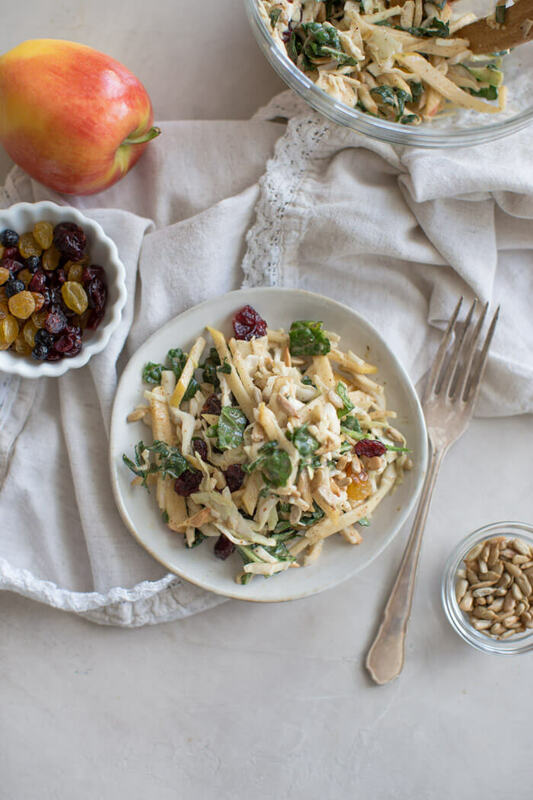 We love the crunch in this salad from all the veg, apples, and sunflower seeds. A blend of apple cider vinegar and almond butter spiked with a dash maple for sweetness is just the creamy tangy dressing needed to jazz up a fall salad. You’ll be downing a whole lotta veg because this flavor combo is addicting. In large bowl, whisk together almond butter, maple syrup and apple cider vinegar until blended together to form dressing. 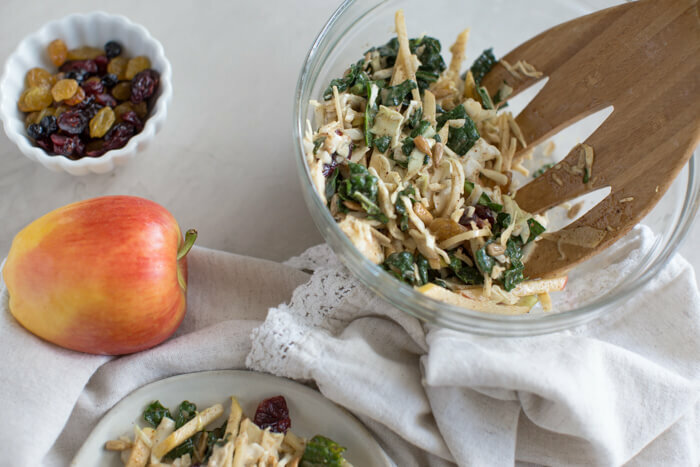 Add kale to bowl and massage dressing into the leaves with hands or mixing spoons; gently toss in cabbage and apples. Fold in cranberries and sunflower seeds and season with salt and freshly ground pepper. Loved this one! The dressing is perfect.